Sir Robert Borden was Canada’s prime minister from 1911 to 1920. Borden led Canada through one of the most difficult periods in its history. He orchestrated its enormous contribution to the war effort while managing growing social tensions and political problems at home. Canada had little control over its military forces or its foreign policy at the start of the war, and no experience with managing a wartime economy. Borden used the scale and importance of Canada’s growing war effort to advocate greater national autonomy within the Empire. He nevertheless believed strongly in imperial solidarity and the necessity of a large-scale military and industrial contribution, and returned in May 1917 from a visit to London and to the battlefront in France convinced that Canada must make every effort, including conscription, to maintain its forces overseas. Borden led a Conservation-Union government to a decisive victory in the bitterly contested 1917 election, and presided over a vast, effective military, industrial, and agricultural mobilization in support of victory. The pressures of war drove Borden’s government to unprecedented levels of involvement in the day-to-day lives of citizens, but not to widespread rationing or wage and price controls. However, rising prices, shortages, and a scarcity of labour led to strikes, charges of wartime profiteering, and economic uncertainty. Borden’s decision in early 1917 to invoke conscription, or compulsory service, in order to maintain Canada’s armies in the field nearly tore the country apart. He won the ensuing fall election amidst controversy and fierce recriminations, maneuvering many Liberals into supporting his Unionist ticket by making the conscription issue a test of loyalty to King and country. Borden improved his chances for victory by giving the vote to likely supporters of conscription (such as soldiers, as well as their mothers, wives, or widows) while taking it away from likely opponents (some recent immigrants). The debate poisoned relations between Canada’s French and English communities, and between the government and organized labour and the farming lobby. The conscription debate continued through the end of the war, embroiled in larger controversies over Western alienation from central Canada, French-English relations, and the power of the federal government in the lives of Canadians. Borden retired from politics in 1920 and died in 1937. 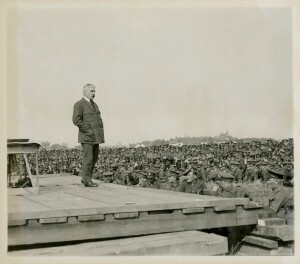 Prime Minister Sir Robert Borden speaks to troops while on a visit to Seaford Camp on 11 August 1918. Borden believed that the sacrifice of the Canadian forces in the field would require Britain to renegotiate with Canada after the war on full sovereignty. But the extreme war effort Borden encouraged in pursuit of victory led to conscription, one of the most traumatic events in Canadian history. Canada would achieve post-war autonomy, as Borden had hoped, but it came at great human cost and after the war had created deep social and political divisions in many parts of the country.